Tristan Steel Doors offer a comprehensive selection of security grilles designed for many applications for industrial, commercial and residential properties. Our security grilles have been design to be both high security and long lasting, manufactured to the highest standards here in the U.K. If you are looking for a bespoke, combined security solution utilising, security grilles, steel doors and/or high security doors for your home or business please feel welcome to call us direct for more information and let us show you why we are the U.K.s number one for security grilles. The TSD1 is an affordable retractable security grilles system particularly suitable for domestic properties. 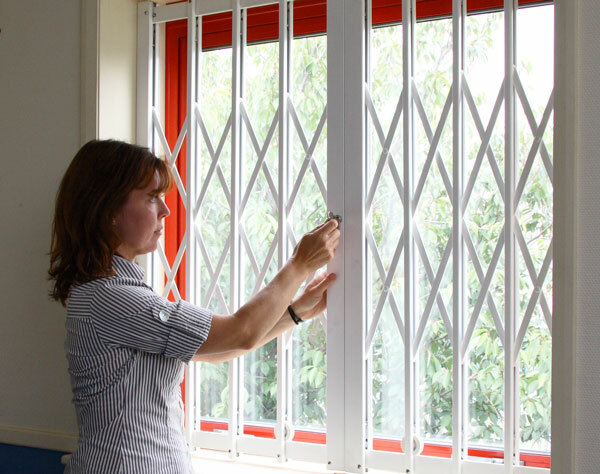 The grille provides a strong physical barrier for protection of windows and doors including patio doors and is an effective visual deterrent against attack. For maximum accessibility in doorways – lift up and life out bottom track options are available as well as a swivel return to hinge back the stack of the grille when open. TSD are proud to offer the market leading TSD2 is a certified retractable security grilles for protection of windows and doors in domestic and commercial properties. Independently attack tested, TSD2 is the first choice when an insurance rated security grille is required. Providing peace of mind against burglary and intruders at home or work, fitting the TSD2 may also reduce insurance premiums. Patented Crosslinx® Rivetless System for added strength provides a much stronger and more attractive alternative to rivets. Made to measure to meet individual customer requirements. Discreetly stacks back to a fraction of the overall size. Ease of access – a low profile bottom track allows ease of access to wheelchairs and pushchairs. Secure and easy to close patented multi-point slam shut lock ensures outstanding protection and ease of use. A number of grilles can also be operated from a single key. Anti-jemmy security strip protecting the lock from attack with a crowbar or other lever. Strong durable finish in a wide choice of colours to blend in with any colour scheme. Exceptionally low maintenance with a zinc plated anti-rust finish and no electrics to go wrong. Costly service and maintenance contracts are not necessary. 24-month manufacturers warranty – in the unlikely event of a quality problem, you are covered by a 24-month manufacturers warranty (providing the grille is fitted in accordance with minimum fixing standards). Planning permission is not usually required. TSD2 has been independently tested to the industry standard of Security Rating 1 (within the certified size range) and is a Secured by Design ‘Police Preferred Specification’. Certified grilles are authenticated with a plaque on the lockpost.